Affordable f/2.8 wide-angle prime lens with manual aperture control. The compact AF NIKKOR 28mm f/2.8D lets you get as close as 0.85-ft from your subject and still achieve a natural wide-angle perspective. Its aperture control ring enables smooth adjustments during Live View shooting. Well suited for nearly any wide-angle subject matter from travel to candids and portraits, the AF NIKKOR 28mm f/2.8D is an affordable, versatile addition to any camera bag. The AF NIKKOR 28mm f/2.8D combines superb wide-angle capability with an exceptionally lightweight (only 7.4 oz) compact design. Whether you’re traveling across the world or across the street, you’ll love the convenience and versatility of the AF NIKKOR 28mm f/2.8D. 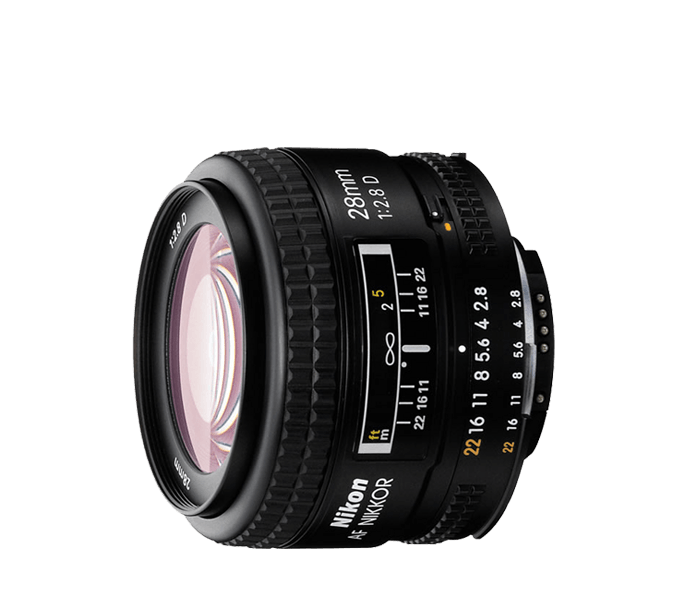 Despite its affordable price tag, the AF NIKKOR 28mm f/2.8D boasts outstanding NIKKOR optics and performance. Its versatility and compact size make it a great addition to any camera bag, and its reliable performance will broaden your shooting opportunities.